A few years ago I gave up the iron game. 15 years of lifting heavy stuff in gyms made me bigger and stronger, but it was also causing 5 to 6 nagging reoccurring injuries and mental burnout. In a desperate attempt to alleviate my pains I turned to bodyweight style exercises for a solid month. At first, my goal was to lose as little strength and muscle as possible while I let my body and mind heal. I figured that if I worked really hard I might even be able to maintain my strength levels through such calisthenics training. You can imagine how surprised and pleased I was to discover that I was bigger and stronger at the end of that month of doing nothing but bodyweight exercises! My injuries were almost all gone and my mind was flooded with fresh motivation, but never had I experienced such a rapid growth in strength and muscle. It’s now 3 years later and I’m still doing bodyweight style bodybuilding. I’m bigger, faster, stronger and far healthier than I ever was while worshiping the iron. This article isn’t about how weight lifting is bad or that you should not do it. I have nothing against weight lifting and don’t wish to discourage anyone from it. My goal is to spread my enthusiasm for these bodyweight muscle building exercises which are far more potent than people often give them credit for. Pull-Ups– Lat pulldowns can’t hold a candle to the exercise that is the first choice for military and law enforcement personnel. The real beauty of the pull-up is that it’s extremely functional and requires lots of stabilization, unlike using machines. It’s also very friendly to your spine and lower back since your lower body just hangs in the air unlike using free weights. It’s powerful, functional, and easy on the spine. What’s not to love? Dips– What, no pushups? Hey pushups are great, but when it comes to really blasting the heck out of your pushing muscles in a safe and effective way, I highly recommend dips. Some folks are afraid of shoulder issues with dips. Yes, you do have to be careful but later on I’ll discuss some ways to help make dips super safe and comfortable. Lunges– Squats are great, but the fact of the matter is that your legs were largely designed for mobility. In fact, most of the work your major leg muscles perform will be to move you from point A to point B. Lunges work your whole lower body in a mobile fashion. They are also great for making your heart rate sky rocket and improving stability in the hips and knees. Single Leg Squats– Squats rule, we know that, but the basics of leg strength isn’t doing squats with a million pounds on your back. It’s squatting down and standing back up on one leg with rock solid control (while holding a million pounds). All 4 of these bodyweight exercises share common traits that make them insanely effective at helping you build lots of muscle and functional strength. Each exercise pits your entire body against gravity. The most functional strength you can ever build is the ability to move your entire body in relation to the earth. If you can do that you can do anything as far as mobility and sports performance. It also ensures that every ounce of your body weight is used to create as much tension in the target muscles as possible. These exercises require minimal equipment and time. One of the secrets to building a lot of strength and muscle is to use methods that you can maintain a consistent program with for as long as possible. Many muscle building programs are great, but they require so much time and effort that the person only sticks with it for about 6 months to a year. These 4 exercises only require a set of gymnastics rings and maybe a pair of cheap adjustable dumbbells. This simple setup ensures that you’ll be able to workout almost anywhere at any time thus making it far easier to stay consistent for years to come. These exercises are easy to load with extra weight. A little extra weight can go a long way with these 4 moves. Even an extra 30 pounds can feel like a ton when doing single leg squats. The dips and pull-ups are easy to load up with just a simple dip belt. You can even just use a length of rope or chain if you like. The leg exercises are easy enough to load up by simply holding onto something heavy. Weights, rocks, sandbags, chains, and even small children can work well for weighted lunges and squats. All 4 exercises require a lot of stability and control. You don’t need stretch bands and balance disks to make exercise functional. All of these moves require balance and stability at every joint in your body. This is especially true for your power joints like your hips and scapula. This stability is also what helps to protect your joints and surrounding tissues. If you feel like something is tight or an issue, move slowly and spend a little extra time isometrically holding the weak points of the move. This will help ensure stable and healthy joints for years to come. These exercises will endlessly challenge your skill levels. Adding volume and intensity is fine, but the bulk of strength comes from learning to do your exercises with a higher level of skill and proficiency. You could do nothing but pull-ups and dips for the next 20 years and still learn how to improve your technique. There is no limit to how far you can go! These exercises evenly work the entire body through a satisfying range of motion. I have nothing against focusing on a few areas of the body. However, if you want as much muscle and strength as possible, then compound moves are where it’s at. These moves work your entire body without leaving a single stone unturned. All of your major joints are flexed and extended in a large range of motion ensuring optimal muscular development and strength. Building a routine around these exercises is a piece of cake. You can do a full body routine with 3 sets of 10-12 reps of each exercise. You can do upper body and lower body splits with 2 exercises in each workout. You can even do a simple 3 day split routine between push, pull and leg workouts. So if you’ve ever wondered if you can make your strength training super simple, yet still very effective then I highly recommend these 4 bodyweight exercises. They work great on their own and can even be incorporated into a traditional weight lifting routine as well. Make sure to visit my profile page on ShapeFit.com and let me know if you have any questions and I will help you out with any concerns about bodyweight based bodybuilding. Will Doing Pyramid Sets Help Me Get Stronger? Great article! What is the workout routine for these exercises? Do I do them all 5 days a week or do I do them 3 times a week? Hi Andy – You can do these exercises 3 days per week (Monday, Wednesday, Friday). Shoot for 2-3 sets of each exercise for 10-12 repetitions. If you’re sore between workouts, make sure to take an extra day to recover before doing the workout again. You need to let your muscles fully recover before hitting them again. Thank you for a speedy response. Let’s see if I see an improvement after a month using only my bodyweight. I think I will do dips and pull-ups on Monday, Wednesday and Friday and then do the lunges and 1 legged squats on Tuesday and Thursday. What about cardio? I am currently 5’11” and 172 pounds. I can see some muscle especially in my chest but I feel that I have also lost a lot of fat. How can I lower my body fat? 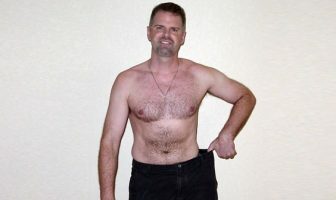 Hi Andy – If you’re holding onto a little extra body fat then you want to add in about 30-40 minutes of cardio after your strength training workouts. Shoot for 3-4 sessions per week and if you’re not losing enough then increase it to 5-6 days per week. The elliptical machine is great for burning a lot of calories quickly but just make sure to use the handles also so you can engage your entire body. Are you doing these in a three round circuit or completing all three sets before moving to next exercise? Also do recommend a specific order? Hi Victor – It’s best to do them in a 3 round circuit. You can do the exercises in order as listed in the article or mix them up, it’s totally up to you. Some people like doing upper body movements first and then moving to the lower body, while others like hitting the lower body first in the circuit. What about exercises for your shoulders? 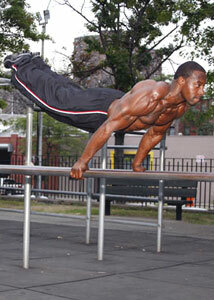 Hi Andy – Regular push-ups are not only great for your chest but they also target your shoulders. Even better are handstand push-ups but they are a bit difficult to perform. You can also do side lateral raises and front raises (without dumbbells) with high repetitions to engage your deltoids. If you have access to elastic exercise bands, these two exercises are excellent for developing your shoulders and you can also include internal and external rotations to target the delicate rotator cuff muscles. Fantastic article! I was doing 10 sets of 50 pushups three days a week last year and put on some decent size. Along with the 3 sets of 12 reps for chins and dips, can I include the 10×50 pushups or should I add bands and go for 3×12 like the other two? Last, can I hit the bag on 2 alternate days? That will be my cardio. I will do eight 3 minute rounds, so that’s a solid 32 minutes of cardio as I jump rope in between rounds during the 1 minute rest. Thanks for your input! Hi Josh – Glad you liked the article. We recommend sticking with the 10×5 pushups so you can do a full bodyweight workout. After 4-5 weeks of that workout, try mixing in the exercise bands. Doing the bag on the 2 alternate days sounds like a great plan for cardio! I’m all about minimalist workouts that could be converted into habits, at home or anywhere else, like brushing my teeth. But I wonder if my shoulders would get enough work with these exercises alone. I know dips hit the front delts, but how about the rear and middle ones? I’ve been doing dips every other day for a couple of months, in a public playground, and pull-ups/chin-ups at home. So far it feels great, but I’m worried about having imbalances. What do you think? 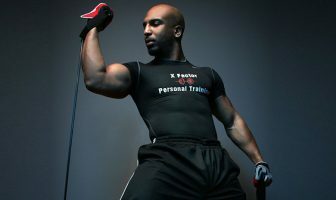 Hi Luis – The best way to make sure your rear and medial deltoids are getting stimulated is to add several exercises using a resistance band which is inexpensive and portable. You can review our Upright Rows and Rear Deltoid Rows exercise demonstrations to learn how to perform those important movements.